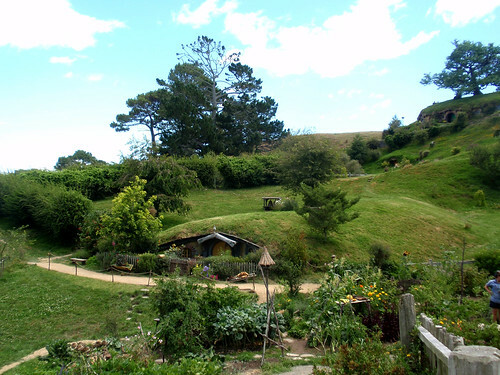 Peter Jackson managed to make the above come alive in The Lord of the Rings and The Hobbit movies, as if Tolkien had written it with New Zealand in mind and as we have driven around this amazing country we keep seeing scenery which could quiet easily be in the films. 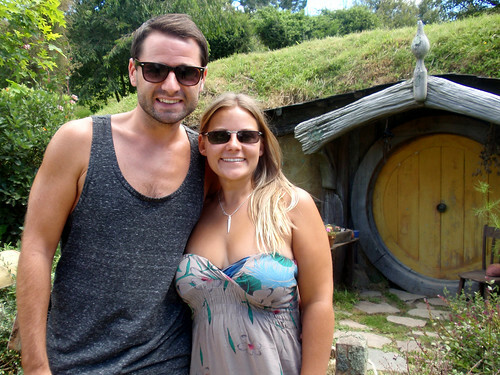 We are already big fans the films (hence all of the references throughout the NZ blogs) so a trip to the The Hobbiton Movie Set was always going to be on the cards. 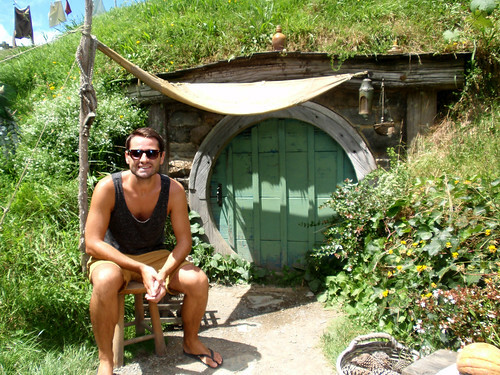 We left Taupo about 10:00 and after only about a hour and a half had made it to the small town of Matamata. 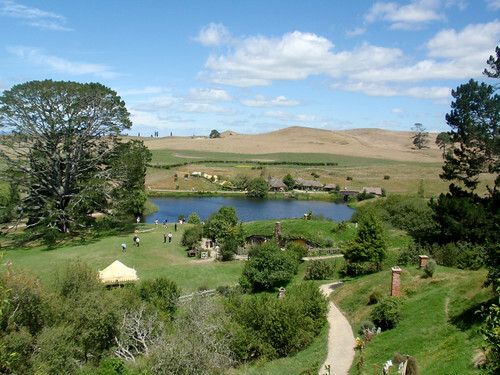 The actual set was built on a small sheep farm just 6km outside of the town, where Peter Jackson had spotted an old tree which would be perfect for the “Party Tree” during a helicopter trip to scout out locations. 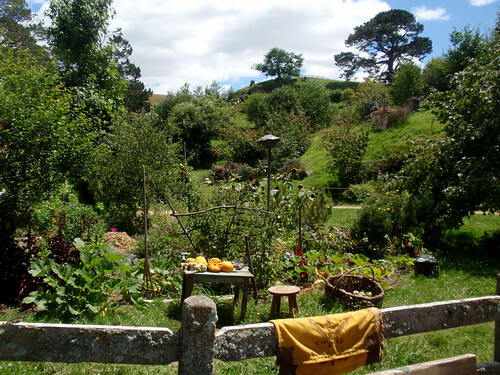 When Peter and some of the artists went to visit the farm with it’s rolling hills and secluded valley, they soon realised this would be the perfect spot to create The Shire and Hobbiton. 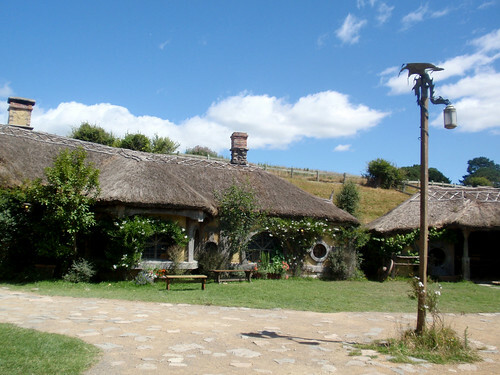 For The Lord of th Rings trilogy, the sets were built out of temporary materials in less than a month for mere 3 months of filming and were dismantled afterwards, however the films were such a success the farm became a tourist destination in it’s own right with flocks of visitors wanting to see it. 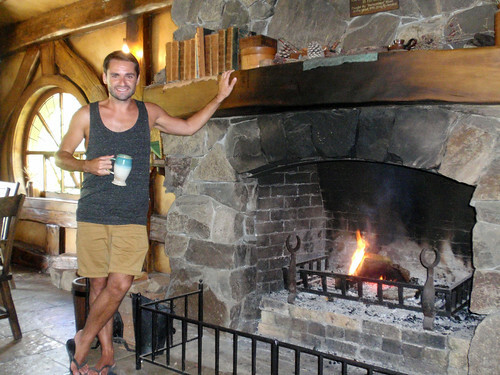 So when they decided to make the next set of movies for the Hobbit they rebuilt all of the sets, this time taking two years with the intention of them becoming a permanent attraction. with the aim of it lasting 50 years (even though it was only used for filming for 12 days in total over a 6 month period!). As we were nearing the end of our adventures, we had decided to treat ourselves to lunch (making a nice change from ham sandwiches). 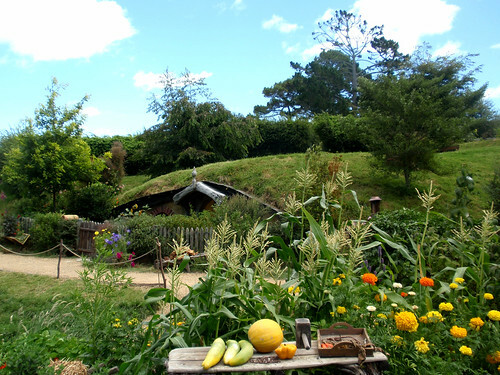 In the heart of the farm is the Shire’s Rest cafe serving homemade food using fruit and vegetables grown in the gardens within Hobbiton. 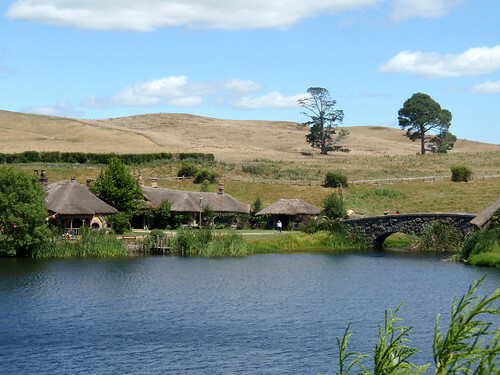 Deciding to go for a very reasonably priced lamb burger we sat in the baking heat chilling out and enjoying the view of the rolling hills and sheep grazing waiting for out tour time (Tours leave every 30 minutes from 9am - 5pm and cost $74). We hopped on board Thorin; a clapped out 1980’s bus with no air-con and sounded like some of the ones we had been on in South East Asia! 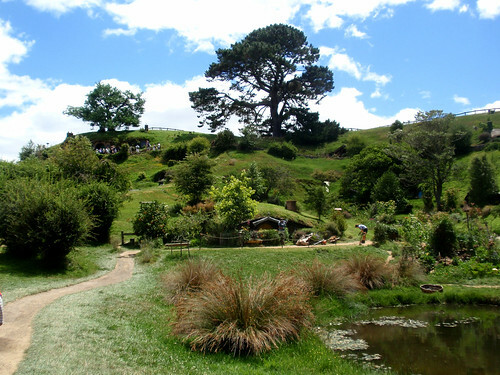 Luckily we were not on this for long, it simply was a way of getting onto the set which was a good 10 min’s drive up a steep winding road which had been built especially by the NZ army who were sworn to secrecy about why it was being put in. 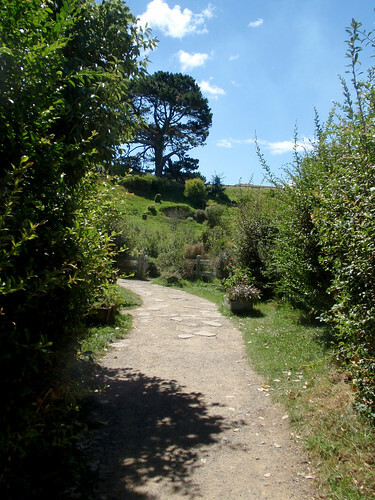 Our two hour tour started at Gandalf’s Cutting a small path between two hills which is used in the opening scenes of both sets of films and which opened out into a small garden. The garden was a real working garden and there was a small army of workers tending to a large variety of fruit and veg all being grown for the cafe. 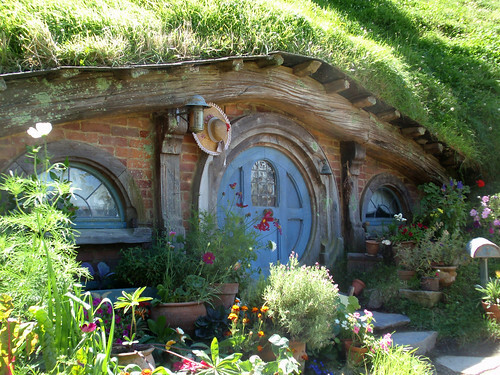 Around us set into the hills were Hobbit Holes with their distinctive round, brightly coloured doors, all unique, all different sizes for filming purposes and all with small tools, washing lines, stools and fences outside. They were so cool to see! Unfortunately you couldn’t go inside any of them as most of them were empty or simply facades, but it was so much fun to weave through the paths and see them all. 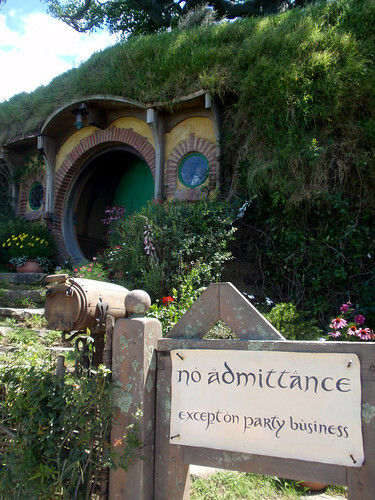 Eventually we climbed the small hill to Bag End and Bilbo and Frodo’s house with it’s immaculate front garden and famous “No Admittance” sign on the gate. 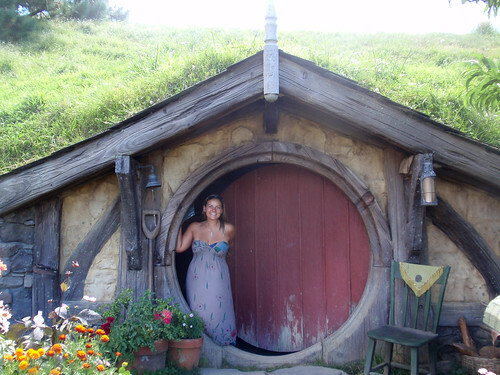 Bag End does have a small interior they used for filming, but sadly we were not allowed in. 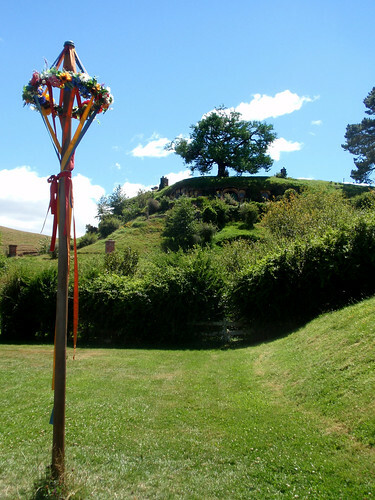 After taking lots of photos we descended the other side of the hill to the Party Field, a clearing in the centre of Hobbiton which was used for the scenes for Biblo’s one hundred and eleventh birthday party. 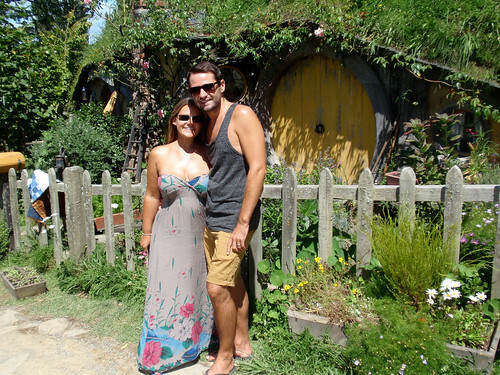 Passing Sam and Rosie’s house with it’s yellow front door and beautiful flower garden, we followed a wooded path to a lovely stone bridge and out final stop the Green Dragon Pub. 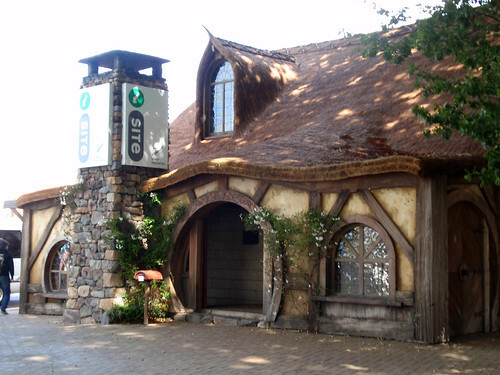 The pub was constructed deliberately at an angle with one end slightly higher than the other, so they could film the actors in perspective. 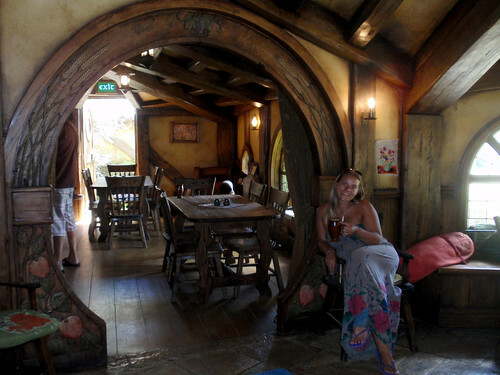 Gandalf, who is supposed to be of normal height would stand at the small end, making the pub seem way too small for him, while Frodo, who was supposed to be 3 feet high, would stand at the tall end making the pub seem the correct height. 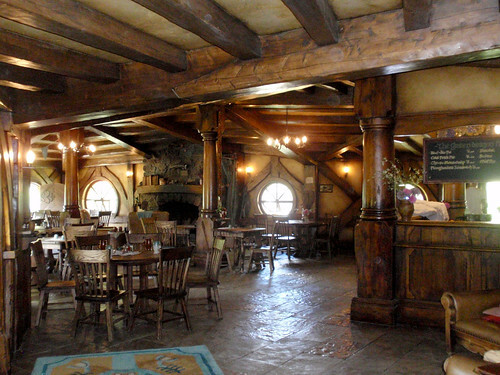 All the interior shots of the pub were filmed in a studio so the pub had to matched to the set when it was opened as a tourist site. 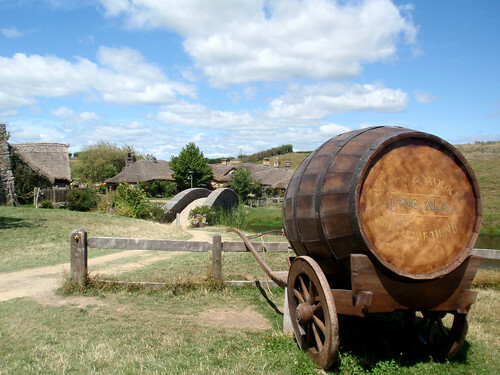 Now it serves a small selection of food, ale, cider and ginger beer for people on the tour. 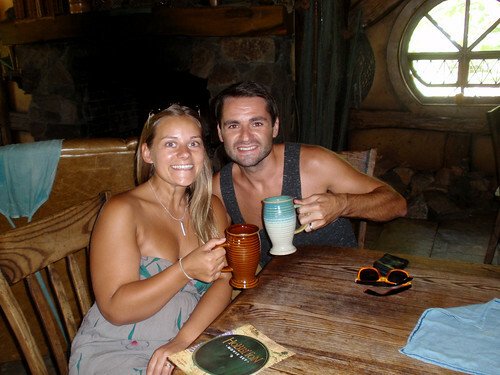 Included in the price of the ticket is one free drink and as the ale and cider was brewed only for this pub we had to try it. Finishing our rather nice drinks we went back out into the glorious sunshine and walked back through the garden to our coach. Having had a fantastic time we now had to find our campsite for the night. 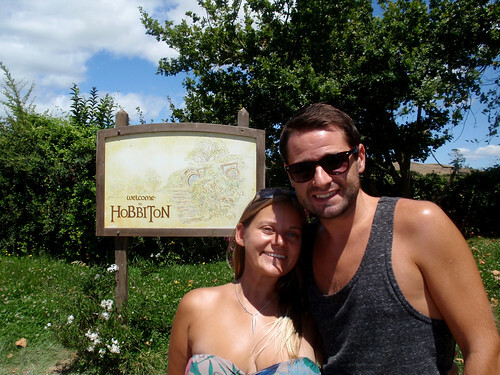 Driving into town we stopped at the i-Site which had been built to resemble a hobbit hole, to get directions to Opal Hot Spa Campsite. Another short drive out of town and we had arrived at our site for the night, the only campsite in town. It was a dump, with horrible looking showers, a TV room which needed ripping out and a pool which was filthy. Being late we settled into our van and plonked on the TV to chill out. 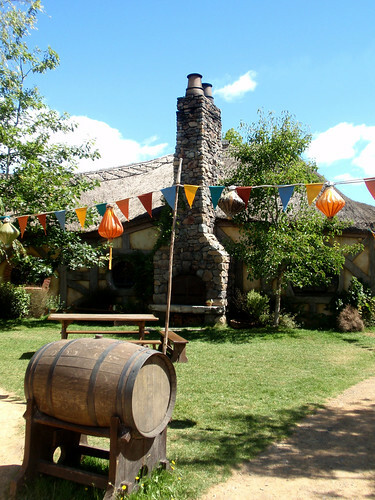 Love the dragon lamp post, and would be great to live there, the pub looks well rude. Stay safe, see you guys soon. Love you bothLoads, caio, Biblo & frodo.